 Boston-born Thomas Dewing began his art career as a lithographer and thus developed an early adeptness for drawing. Desiring a more advanced education, he left for Europe in 1876, primarily studying in Paris at the Académie Julian. One of the most important artists of the US's turn-of-the-century Gilded Age, Dewing was best known for his elegant and often enigmatic depictions of women. Rendered in sparse, airless interiors and poetic landscapes, Dewing's artfully posed figures evoke a dreamlike sense of timelessness. At the height of his career, the artist's finely wrought compositions were admired and collected by such powerful patrons as Charles Lang Freer, John Gellatly and Stanford White. For Dewing, the female represented an ideal form of beauty � the perfect artistic vehicle. It was a subject over which he reigned supreme. — Apprenticed at an early age in a lithography shop, he went to Paris in 1876 to study at the Acad�mie Julian, where he took courses on anatomical drawing and modeling taught by Gustave Boulanger and Jules-Joseph Lefèbvre. There he learnt an academic technique; the careful delineation of volumetric form and meticulous but subtle evocation of texture were to be constant features of his work. In Paris he became friends with US painter William Merritt Chase [01 Nov 1849 – 25 Oct 1916]. Paintings which Dewing did after his return to the US in 1878, such as Morning (1879), in which two enigmatic figures in Renaissance costume blow delicate, elongated horns before a pair of attentive whippets, have a symbolic quality closer to the work of the Pre-Raphaelites than to contemporary French painting. In addition, they have an aesthetic languor and preciousness reminiscent of James McNeill Whistler. In the considerably more vigorous The Days (1887), the shallow frieze-like arrangement of robust, rhythmically interacting women in classical drapery strongly recalls the art of Albert Joseph Moore and Lawrence Alma-Tadema. By 1888 Dewing was taking fewer portrait commissions because of his belief that “portrait painting is not art.” He began a new phase in style and subject matter, in which elegant women in sparsely decorated monochromatic rooms and soft, hazy landscapes dominated his work. He drew on inspiration from the paintings of Vermeer [1632-1675] and from the aesthetics of James McNeill Whistler [1834-1903] and Albert Moore [1841-1893]. From 1922 to 1927 Dewing worked almost exclusively in pastels. He suffered a nervous breakdown in 1924 and stopped painting in 1930. — Dewing's students included Irving Wiles. — The Spinner (1880, 107x137cm; 1000x774pix, 52kb) _ Dewing's academic training in France served to refine his keen draftsmanship, readily apparent in this painting. Also known as Priscilla at the Spinning Wheel, this work was painted in Boston soon after the artist returned from Paris. The carefully modeled features and smooth brushwork also reveal Dewing's academic training abroad. The painting's hard-edged technique varies significantly from the artist's more well-known tonalist works of the late 1880s and 1890s. The work, however, with its solitary female figure quietly posed rather than actively working her craft, is ideologically related to the artist's later paintings of elegant, passive women absorbed in ethereal environments. The Spinner differs greatly from a contemporary work painted in 1881 by Mary Cassatt, Lydia at a Tapestry Loom. Turned from the viewer and self-absorbed, Cassatt's sister aggressively works her loom. Dewing's model sits idly, any affectation of work diminished by a veneer of genteel charm. The viewer is not asked to take her labors seriously. The young woman is an attractive object for the contemplation of the spectator, whom she demurely faces with downcast eyes. Painted only four years after the Philadelphia Centennial, the work reflects the interest in the Colonial Revival stirred by that celebration. The centennial displays of early Americana served to ignite pride and interest among the people of the US in their early cultural heritage. The art of spinning was, of course, by 1880 no longer a common household activity. The Queen Anne chair and the model's costume are also reminiscent of past eras. The evident domesticity and old-fashioned accoutrements surrounding the young woman recall a time when women more keenly "knew their place" at home and does little to reflect changes occurring among the female population in late nineteenth-century Boston. In 1880 the women of Boston were beginning to take an active role in public life. Because of Civil War casualties, there was a "surplus" of 75'000 women in the city, many of whom were independent, self-supporting, and active in suffrage and other civic and social reform movements. There is a contradiction between the artist's images of women and the realities of their lifestyle. They are not the restless contemporary women, aggressive efficiency is far from them; they can do nothing and do it beautifully. Dewing's mood of quiet contemplation almost amounts to an ironic comment on the strenuousness of the typical modern woman. Although not technically a member of the Boston School of painters (active from about 1890 to 1910), Dewing has been linked with their quiet depictions of leisure-class women in domestic interiors. Unable or unwilling to face the complex realities of the Boston woman's expanded sphere of influence, the Boston man portrayed her as a beautiful dreamer instead of an energetic reformer, and thus turned the real Boston lady into an idealized work of art. Dewing's own confession that he dwelt in a "poetic and imaginative world" implies a retreat from reality. A tag on the back of The Spinner reads "Decorative Study", giving credence to his admission that he generalized his models for pleasing aesthetic purposes. ^ Died on 04 May 2003: Alexander “Skunder” Boghossian, Ethiopian-born artist who played an important role in introducing European modernist styles into Africa and who, as a longtime resident of the United States, became one of the best-known African modern artists in the West. — Born in Addis Ababa, Ethiopia in 1937, Skunder (as he prefered to be called) eventually moved to Washington DC, where he became Associate Professor of Painting at Howard University (1974-2001). In 1955, he had received an Ethiopian Government scholarship to study in Europe, where he studied at Saint Martins School, Central School, and the Slade School of Fine Arts, London. In 1957, Skunder moved to France, where he attended and taught at the Ecole National Superiore des Beaux Artes de Paris, and the Académie de la Grande Chaumière, Paris from 1957 to 1966. Skunder returned to his country, Ethiopia, in 1966, and for the next three years taught at the Fine Arts School of Addis Ababa where he left a lasting impact on a generation of younger Ethiopian artists in spite of his short stay. After moving to the US, Skunder continued to impact Ethiopian modern painting through several Ethiopian artists who followed him to Howard University and studied under him. Skunder was one of Africa's best known contemporary artists and internationally exhibited. For the last twenty years of his life his art and style have defined modern Ethiopian painting. — Boghossian, whose original first name was Alexander and who used the name Skunder professionally, was born in Addis Ababa in 1937 (after 04 May). In 1955, on a scholarship from the Ethiopian government, he enrolled at the Slade School of Fine Art in London, and two years later moved to Paris, where he taught at the Acad�mie de la Grande Chaumi�re. In Paris, he became associated with the Senegalese philosopher Cheikh Anta Diop and other figures in the Pan-African and negritude movements. Boghossian's art combined European media like oil paint, crayon, and ink, with bark and animal skins. Often hallucinatory in quality and filled with intricately detailed figures and patterning, his work was influenced by Paul Klee, Max Ernst and the Cuban artist Wifredo Lam, but more strongly by Coptic and West African art. In 1966, he returned to Ethiopia to teach at the School of Fine Arts in Addis Ababa. He stayed only three years, but his presence helped revolutionize contemporary art in the country. In 1969 he moved to the United States, where he became artist in residence at Atlanta University and instructor at the Atlanta Center for Black Art. He taught painting at Howard University from 1974 through 2000. Several of his Ethiopian students, including Zerihun Yetmgeta, Wosene Worke Kosrof and Tesfaye Tessema, followed him to the US. Boghossian's influence in Ethiopia itself remained strong. � Boghossian was born in Addis Ababa in 1937 to an Ethiopian mother and an Armenian father. In 1955 at age 17, he won a scholarship to study art in London, and in 1957, he moved to Paris to study at art academies there. In 1966, he returned to Addis Ababa to teach at the Fine Arts School, and he remained there until 1969, when he came to the United States as resident instructor in sculpting, painting and design at the Atlanta Center for Black Art, where he also was an artist-in-residence. He came to Washington and joined the faculty at Howard University in 1972. For the next 29 years, he trained and coached generations of students in the development of their artistic talents, while continuing with his own artistic endeavors. His paintings were described as both powerful and serene, effectively blending bright colors, lines and images. For the last two decades of his life, Boghossian was widely considered the unofficial patriarch of the expatriate Ethiopian arts community in Washington. His art, which he once described as a "perpetual celebration of the diversity of Blackness," has been displayed at dozens of art festivals and shows around the world, in traveling exhibits and in one-person shows. Although Boghossian had not lived in Ethiopia for the last 33 years of his life, his artistry remained deeply rooted in his Ethiopian heritage and culture, and it was replete with ancient symbols and icons. Boghossian summoned in his art the spirits of his land. Or, rather, of his lands . . . his moving, heart-felt pictures mix the American with the African, the observed with the imagined, the ancient with the new. �- Night Flight of Dread and Delight (1964, 637x745pix, 51kb) _ Growing up in Ethiopia, Skunder Boghossian was inspired by that country's centuries-old tradition of Christian religious painting. In 1955 he went to Europe to study art, first in London, then Paris, where he was influenced by Surrealism. Painted in Paris, Night Flight of Dread and Delight is a visionary fantasy that partakes of Surrealism's fascination with dreams and metamorphosis. Like many Surrealist works, the painting was inspired by literature, in this case the novels of Nigerian writer Amos Tutuola, which are filled with spirit beings, supernatural forces, and mystical transformations. Thus the painting reflects both the influence of European modernism and the Pan-African movement, which encouraged African artists to draw inspiration from the creativity of the entire continent. ^ >Born on 04 May 1770: baron Fran�ois Pascal Simon Gérard, French Neoclassical painter and illustrator who died on 11 January 1837. — He spent most of his childhood in Rome, where he was born. His talent as an artist revealed itself early and during this period he acquired a love of Italian painting and music, which he never lost. In 1782 his family returned to Paris, where, through the connections of his father�s employer Louis-Auguste le Tonnelier, Baron de Breteuil, Minister of the King�s Household, G�rard was admitted to the Pension du Roi, a small teaching establishment for young artists which had been founded by the Marquis de Marigny. After 18 months he entered the studio of the sculptor Augustin Pajou, where he remained for two years, before transferring to that of the painter Nicolas-Guy Brenet. He became a student of David in 1786 and quickly found special favor with his master.  Gérard was one of the most accomplished students of Jacques-Louis David [1748-1825] to emerge during the 1790s. Best known for his portraits, he carried on the tenets of David's classical teaching into the 1830s. Gérard was born in Rome and spent his childhood in Italy where his father served as an administrator under the French ambassador to the Holy See. After his family returned to Paris, he apprenticed to the sculptor J.-B. Pajou and then the painter Nicholas-Guy Brenet before entering David's studio in 1786. Gérard took second place in the Prix de Rome of 1789 but did not compete further. Illustrations for works by ancient authors published by Didot Freres helped him support his family during the Revolution. He exhibited at the Salons of 1791 and 1793 but drew particular attention for his Belisarius at the Salon of 1795 and his portraits from the later 1790s. Napoleon confirmed his fame with commissions for official portraits and decorations on the theme of Ossian for his home at Malmaison, and there followed a series of large history paintings, such as the Battle of Austerlitz of 1810. Commissions continued under Louis XV111, and his Henry IV Entering Paris. Much honored and decorated, Gérard continued to paint until his death in 1837 although his work declined in quality after about 1830. — Among Gérard's students were Antoni Brodowski [bap 26 Dec 1784 – 31 Mar 1832], Constance Marie Charpentier [1767 – 03 Aug 1849], Peter Krafft [15 Sep 1780 – 28 Oct 1856], Victor Schnetz [14 Apr 1787 – 16 Mar 1870], Joseph Karl Stieler [01 Nov 1781 – 09 Apr 1858]. Paulin Guérin [24 Mar 1783 – 16 Jan 1855] was Gérard's assistant. �- La Comtesse de Morel-Vinde et sa Fille aka La Leçon de Musique (1799, 201x143cm; 1134x792pix, 67kb _ .ZOOM to 2268x1583pix, 214kb _ .ZOOM+ to main detail 2592x2304pix, 1065kb _ .ZOOM++ to detail 1: mother, head and shoulders 1651x1152pix, 106kb _ .ZOOM++ to detail 2: daughter, head and shoulders 1727x1152pix, 101kb)_ the title on the music score is “à ma mère”. — Louis-Philippe et ses Fils, les Ducs de Chartres et de Nemours (34x27cm; 769x592pix, 335kb_ .ZOOM to 2295x1751pix, 2922kb) badly in need of restauration: much pockmark damage and some crackling and scratches. — Psyché et l'Amour (1206x850pix, 111kb) _ Psyche Receiving the First Kiss of Love from an adoloscent Cupid. _ Madame Récamier (1992) by Vinicius Pradella.  Bernhard Strigel was born into a family of artists in Memmingen, a city in the Allg�u region of southern Germany. His grandfather, Hans Strigel the Elder, was a painter and the head of a workshop. Bernhard's father was either Hans Strigel the Younger, a painter, or his brother Ivo Strigel, a sculptor. It is most likely that Bernhard was trained as a painter in the family shop. The earliest work that can be associated with Bernhard Strigel is the left wing of an altarpiece with Saints Vinzentius, Sebastian, and Michael, orginally located in the church in Spl�gen (Graub�nden). The carved center portion by Ivo Strigel and the other wing are no longer extant. In addition to some Netherlandish influence that may indicate a journey to the Lowlands in the 1480s, Strigel's early work reflects the influence of the late Gothic style of the Ulm painter Bartholom�us Zeitblom. Strigel assisted Zeitblom with the predella and six panels, datable 1493/1494, that form the high altar of the cloister church in Blaubeuren. In the course of the 1490s Strigel became an independent master in Memmingen and began to produce both religious paintings and portraits. Strigel attracted the attention of Maximilian I and the portrait dated 1504 is one of the earliest of numerous portraits of the emperor produced by the artist and his shop. In 1515 Strigel left Memmingen to work in Vienna as court painter to Maximilian. Here, in the same year, he produced one of the earliest group portraits in Germany, Maximilian I and his family. Strigel must have returned to Memmingen almost immediately, for in 1515 he collaborated with the sculptor Hans Thoman on an altarpiece (now lost), and between 1516 and 1518 he is recorded as holding significant positions in the Memmingen city government and the trade guild. His depiction on two panels of Konrad Rehlinger the Elder and his children, dated 1517, is at once a superb portrayal and one of the earliest large-scale, full-length independent portraits. Strigel returned to Vienna in 1520. In the interim the portrait of Maximilian I and his family was acquired by the humanist and court advisor Johannes Cuspinian, who had Strigel add a Holy Kinship to the reverse and also paint a separate but matching portrayal of Cuspinian and his family. The lengthy inscription on the back is an important primary document; by stating that Strigel was sixty years old in 1520, it helps establish the artist's birthdate. We also learn that Strigel painted the Cuspinian portrait with his left hand and was "proclaimed noble" by Maximilian, although it is unclear whether Strigel's nobility took the form of a payment or a title. Strigel was back in Memmingen by 1521/1522 and working on a "Holy Tomb" for the Church of our Lady. As a person of importance and influence Strigel was sent between 1523 and 1525 to represent Memmingen at the court in Innsbruck and in Ulm, Augsburg, and other cities. As the Reformation engulfed Memmingen in the mid-1520s, Strigel acted as a mediator between the various factions. The artist himself was apparently sympathetic to the new ideas. In his last years he seems to have abandoned religious works and devoted himself almost exclusively to portraiture. Bernhard Stridel died in Memmingen. His oeuvre consists of approximately ninety paintings and a small corpus of attributed drawings. In the absence of a son, his workshop was taken over by his brother-in-law Hans Goldschmidt, who resided in the Strigel household from at least 1521 on. — Dr. Georg Thannstetter (1515, 42x29cm; 2500x1594pix, 1163kb) _ In the pendant portraits, probably of Dr Georg Thannstetter [1482�1535] and his wife Martha Werusin (or Merusin), a severely geometrical structure underpins the composition into which the figures are logically integrated. Maximilian I�s court painter probably painted the portraits in 1515 to mark his sovereign�s visit to Vienna for a double wedding that had important dynastic implications. Dr. Georg Thannstetter was a physician, mathematician, and cartographer, and he held a chair at the University of Vienna. He had been personal physician to the Emperor Maximilian since 1510. As a humanist, he combined his medical knowledge with astrological research; his role was that of polymath at the imperial court. The artist�s choice of a half-length figure in three-quarter profile was the usual form for a scholar�s portrait at the time. Strigel also used this format involving the head and shoulders offset against a length of damask with a landscape view to one side in several portraits of Maximilian I. Choice of the same format probably reflects Thannstetter�s self-confidence and the respect accorded to humanists by society. On the other hand, it is also typical of the sixteenth century that no typological distinction is made between rulers and the lower social orders. Strigel uses the background, which forms a uniform space with that in the portrait of Thannstetter�s wife, to show that the two paintings belong together. The couple face in towards each other, their gazes focused on the same point. — Martha Thannstetter, n�e Werusin (or Merusin) (1515, 42x28cm; 2500x1609pix, 1540kb) _ In this portrait the viewer�s attention is caught mainly by the lady's subtly characterized and elaborately wrapped headscarf. Its translucent fabric appears to be fastened with a single gold pin, and now allows her dark cloak and then the red brocade in the background to shimmer through, while several overlapping layers on her head give the impression of an opaque bonnet. Usually made of white linen and concealing the head and neck, such headgear had been considered appropriate for a married woman since the early Middle Ages.  The Annunciation to Saint Anne and Saint Joachim.  Saint Ladislas Presents Wladislav II and his Sons to the Virgin (1512, 43x31cm) _ detail _ The coat-of-arms at the lower right part of the painting refer to the family of the king (that with the Polish crowned eagle) and the most important countries of the king (Hungary, Dalmatia, Bohemia). The painting represents an interesting transition between an idealized portrait and a religious picture. ^ Born on 04 May 1826: Frederic Edwin Church, US Hudson River School painter, specialized in landscapes, who died on 07 April 1900. — For his spectacular and panoramic paintings of the wilderness of North and South America, Church was a dominant figure in the second generation of the Hudson River School. His canvases celebrated the drama of the US frontier and expressed the expansionist and optimistic outlook of the United States in the mid-nineteenth century.  Frederic Edwin Church, born in Hartford, Connecticut, was the son of a wealthy man whose considerable assets provided the youth with the means to develop his early interest in art. By the age of sixteen, he was studying drawing and painting; two years later, Daniel Wadsworth, son-in-law of John Trumbull and, like Trumbull, a patron of Thomas Cole's, prevailed upon Cole to take Church as his student. Church's precociousness displayed itself quickly. Within a year, he had been shown in the National Academy of Design annual exhibition; the following year, he sold his first major oil, to Hartford's Wadsworth Atheneum. Extraordinarily gifted as a draftsman and a colorist, Church reached his early maturity by 1848, the year he took a studio in New York City, accepted William James Stillman as his first student, traveled widely and collected visual materials throughout New York and New England, particularly Vermont, and turned out a number of pictures, all of which sold well. From 1854 through 1856, in addition to retracing familiar paths, Church followed new ones as well, visiting Nova Scotia, traveling widely in Maine, New Hampshire, and Vermont, and going several times to take sketches of Niagara Falls. For Church, from the late 1850s until the beginning of the Civil War was a time of triumph piled upon triumph. A second trip to Ecuador, in 1857, and a voyage to Newfoundland and Labrador, in 1859, provided material for future major paintings, but it was his Niagara, completed in 1857, and Heart of the Andes, in 1859, that guaranteed for him, still a young man, the role of the US's most famous painter. In 1860, Church bought farmland at Hudson, New York, and married Isabel Carnes, whom he had met during the exhibition of his Heart of the Andes. His marriage to both  his wife and his farm  became the joint center of his life, in later years tending to divert his attentions from painting major canvases. Church's happiness was blasted in March of 1865, when his son and his daughter died of diphtheria, but with the birth of Frederic junior in 1866, Church and his wife began a new family that was eventually to number four children. In late 1867, the Churches launched on an eighteen-month trip to Europe, North Africa, the Near East, and Greece that was the genesis of several important pictures. Church, however, began to devote his creative energies increasingly to gentleman farming and to the designing and redesigning of Olana, his hilltop fantasy of a Persian villa at Hudson, New York, a seemingly endless undertaking begun in 1869 in consultation with the architect Calvert Vaux. From the 1870s until his death afflicted with painful rheumatism of the right arm, which interrupted or prevented work on major pictures, Church still managed to produce in his later years a few large retrospective canvases. His final artistic legacy was a multitude of breathtaking small oil sketches, mostly of Olana or of the area around Millinocket Lake in Maine, where he bought a camp in 1880, or of Mexico, where he began wintering in 1882. These are at once a magnificent testimony to his undiminished gifts as a draftsman, painter, and colorist and one of the glories of US art. — Born in Hartford, Connecticut, Church was the son of a wealthy businessman. He received his early art training from local painters Benjamin Hutchins Coe and Alexander Hamilton Emmons. In 1844, with the help of the art patron Daniel Wadsworth, he became the first student of the famous Hudson River School painter Thomas Cole. While studying at Cole�s studio in Catskill, New York, Church absorbed his teacher�s methods of sketching and became a proponent of his epic style of painting. Upon completing two years of training, Church moved to New York, where he established a studio in the Art-Union building. Church was successful in New York. In 1848, he became one of the youngest artists to be elected to the status of academician at the National Academy of Design, and he was soon training students of his own, including Jervis McEntee and William James Stillman. In the subsequent period, Church emulated Cole�s art, painting large-scale landscapes of the Hudson River Valley and of New England. Influenced by the writings of English theorist John Ruskin, he began to paint in a more precise manner, focusing on specific effects of weather and atmosphere. He was also inspired by the writings of Alexander von Humboldt, a German naturalist-explorer. Church gradually began to take a more scientific approach to nature, using sketches he had created in the outdoors in the preparation of his canvases. In 1853, he became the first American artist to visit South America. Accompanying Cyrus Field, who later gained renown for his participation in the transatlantic cable project, Church followed Humboldt�s 1802 route from Colombia to Ecuador. Along the way, Church drew from nature, producing the drawings that became the basis for important canvases depicting exotic subjects such as The Cordilleras: Sunrise (1855). When his works received high praise, Church set off on a second expedition in 1857. On this sojourn, he traveled to Ecuador with the landscape painter Louis Rémy Mignot. It was on this trip that he was able to concentrate on the scenery of the Andes, and he filled diaries and sketchbooks with records of the vegetation and the countryside. Characterized by vast vistas and atmospheric detail, the works that resulted from this sojourn demonstrate Church�s unique approach. Among the great triumphs of the artist�s career was Heart of the Andes (1859), in which Church captured the essence of the tropics. Another significant product of this period was Niagara (1857), which established Church as the leading interpreter of the US spirit. During the 1860s, Church continued to travel, seeking subject matter for his paintings. He continued to produce visions of the tropics such as Twilight in the Wilderness (1860) and Cotopaxi (1862) until 1867, when he took a year and a half trip to Europe and the Middle East. He first spent six months in London and Paris, and then continued on to Alexandria, Beirut, Constantinople, Baalbeck, Petra, and Jerusalem. Due to his fascination with ancient civilizations, he also visited Naples, Paestum, and Greece. On his return, he stopped in London, in order to study the works of Turner. The results of this trip were numerous oil sketches and drawings that he used for a series of paintings including The Parthenon (1871) and Jerusalem from the Mount of Olives (1870). By 1880, Church�s painting activity was curtailed due to ill health, and in 1883, rheumatism crippled his right arm and hand. In 1890, he settled at Olana, his grand villa near Hudson, New York, which had been designed for him in the Persian and Moorish styles by the architect Calvert Vaux in 1870. The house, which is preserved as a museum today, reflected Church�s eclectic interests and his travels, including exotic furnishings and decorative objects. 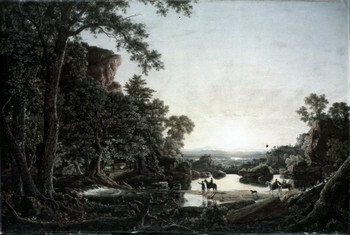 The artist adorned the walls with works by the Old Masters, especially landscapes by Claude Lorrain and Salvator Rosa. Although he spent the winters of his last years in Mexico, Church spent most of the final phase of his life at Olana. He died in New York City. — Otter Creek, Mt. Desert (1850, 43x61cm; 577-x800-pix, 97kb _ ZOOM to 1180x1650pix, kb) _ When Church visited Maine in 1850 to paint the coast, he followed in the footsteps of several other American painters. Thomas Doughty had painted there in the 1830s and in 1836 had exhibited his view of the lighthouse of Mount Desert Island at the Boston Athenaeum. Church's esteemed teacher, Thomas Cole, had first visited Mount Desert during the summer of 1844. And Church may have seen Fitz Henry Lane's Twilight on the Kennebec River, which was exhibited in 1849 at the American Art-Union in New York City, where Church lived and retained a studio. The clarity of light and atmosphere in Church's cabinet-sized picture is reminiscent of works by German painter Andreas Achenbach and the D�sseldorf masters, whose polished and carefully delineated landscapes were highly acclaimed during the late 1840s and 1850s when they were exhibited at the American Art-Union. When Achenbach's Clearing Up, Coast of Sicily (1847) received commendation in the press, the Bulletin of the American Art-Union reported that Church, along with two other painters, had gone off to Maine with the magnificent coastal painting by Achenbach in mind. Like Cole, who had been greatly inspired by his circle of Knickerbocker writers, Church may have been motivated to visit the Maine coast by the contemporary essays of New Englander Henry David Thoreau, whose own pursuit of the US wilderness took him to Maine. In 1848 Union Magazine published Thoreau's "Ktaadin and the Maine Woods," which described his travels deep into the interior of the state. When Church visited Otter Creek in 1850, Maine was still largely considered wilderness. The artist spent most of his time on the coast, although he would later visit many of the sites Thoreau described, including Katahdin, the tallest mountain in the Northeast. Recalling Cole's depictions of the US wilderness and the encroachment of civilization, Church juxtaposes the majestic, craggy faces of Cadillac and Dorr mountains and the settlers' cottage visible at their base.  Twilight in the Wilderness (1860, 102x163cm; 551x901pix, 56kb) _ Although this is a convincing landscape, it does not depict a specific place. Church created it by combining several different sketches made in Maine and New York. The dramatic light electrifying the entire composition is based on sunsets he witnessed from the window of his New York City studio. Perhaps the artist intended twilight to suggest the end of a cosmic cycle, a meaning that coincides with the feeling that the coming Civil War would change US civilization forever. The panoramic splendor created by brilliant clouds floating above a tranquil landscape also suggests the divine authority of "manifest destiny," the idea that US citizens of European stock had a right to the continent. Seen by large numbers of people in the US in a touring exhibition organized by Church himself, this picture was marketed as essentially "American"  a comforting, patriotic image of the US wilderness. _ Ruins of the Parthenon (1880, 70x135cm) by Sanford Robinson Gifford [10 Jul 1823 – 24 Aug 1880]. _ A Dragon's Fervent Prayer of Thanksgiving and Celebratory Spouting of Fireworks to Selene for Enjoying a Tropical Moonlit Night Far From Any Iceberg (549x455pix, 19kb). — Cayambe (1858, 76x122cm; 564x920pix, 102kb) _ Cayambe is a peak, 5790 meters above sea level, in the Andes in Ecuador. _ Cayambe Landscape by Antonio Moncayo. — Verres et bouteilles (1926, 73x60cm; 512x423pix, 17kb) _ Ozenfant and Charles-Édouard Jeanneret (later famous as the architect “Le Corbusier”) founded a style of painting known as Purism. Their work applied the principles of classical proportion to products of the machine age. The fluting of the bottles in this painting recalls classical columns, and is echoed in the various neighboring forms. These rhythmic relationships create a harmonious unity, which embodies Ozenfant�s belief that order gives rise to aesthetic experience. He wrote, �The highest delectation of the human mind is the perception of order, and the greatest human satisfaction is the feeling of collaboration or participation in this order�. >1894 Émile Renouf, French painter born on 23 June 1845. –- Un Coup de Main (1881, 152x226cm; 791x1120pix, 59kb) Renouf's most famous painting. 1752 Peeter Snyers le Saint, Flemish artist born on 30 March 1681. ^ 1739 Andrey Matveev (or Matveyev), Russian painter born in 1702. His gift for painting was first noted by Peter the Great and in 1716 he received a grant to visit Holland, and from 1717 he studied art in Amsterdam under Arnold Boonen and at the Koninklijke Academie voor Schone Kunsten in Antwerp. While still a student he painted an Allegory of Painting (1725) and Venus and Cupid (1726), which show that he had already absorbed much of the technique and style of European painting, an achievement of great importance to the development of a new style in Russian art. After his return to Russia in 1727, he became the leading painter of Saint-Petersburg and took part in all important architectural projects. Wall paintings in several historical buildings in St. Petersburg are attributed to Matveev. — Princess A. P. Golitzina (1728) _ Princess Anastasia Golitzina [1665-1730] was the wife of Prince I. A. Golitzin. She was a lady-in-waiting for the Russian Empress Catherine I. She was arrested and punished by beatings, as she was suspected in participating in the conspiracy of Tzarevich Alexey Petrovich (son of Peter the Great from his first wife) against Peter I the Great, but in 1722 she was returned to the court. — The Physician Ioann Azaretti (1729) _ Italian, Azaretti was educated in the University of Padua and received a diploma of Doctor of Medicine. Since 1721, he was in service in Russia, taught anatomy in the Saint-Petersburg Hospital. Since 1733, he was in Russian military service. In 1742, he was arrested, but only for a short while. He then continued practicing medicine in Moscow where he died in 1747. >1923 Alfredo Hlito Oliveri [–1993], Argentinian painter. ^ 1909 Andr� Hambourg, French painter who died on 05 December 1999. N� � Paris, il d�couvre la peinture en 1925. Él�ve aux Écoles Nationales des Arts D�coratifs et des Beaux-Arts, il participe d�s 1927 aux principaux Salons de Paris o�, en 1930, une exposition particuli�re, tr�s remarqu�e par la critique, lui est consacr�e par Henri B�n�zit. Il d�couvre la Normandie et Honfleur en 1931. il �pouse en 1948 Nicole Rachet, petite-fille et ami du m�decin d�Eug�ne Boudin. Il aime les �tendues d�eau sous les grands ciel d�Honfleur, Londres, Venise, Istanbul. Prix de la villa Abd-El-Tif en 1933, il effectue de nombreux s�jours en Afrique du Nord o�, mobilis� en 1939, il devient correspondant de guerre; ses articles et ses dessins se succ�dent dans la presse jusqu'en fin 1945. Grand voyageur, peintre titulaire de la Marine, il rapporte de ses nombreux voyages, �tudes, peintures et dessins et travaille notamment en Normandie, � Paris, � St R�my de Provence, o� il a ses ateliers. Ses expositions se succ�dent dans les galeries et mus�es en France et � l'�tranger. Une salle lui est r�serv�e au mus�e de Trouville-sur-mer. En d�cembre 1988, un �tage est construit pour l'importante donation "Hambourg-Rachet" au mus�e Eug�ne Boudin � Honfleur, o� sont r�unis plus de 200 de ses peintures et dessins. Refusant toute concession au go�t du jour, il poursuivit une �uvre o� se c�toient figures, paysages, marines, natures mortes de tous formats, des grandes d�corations murales et des illustrations d'ouvrages de bibliophilie. 1835 Stefano Bruzzi, Italian artist who died on 05 January 1911.